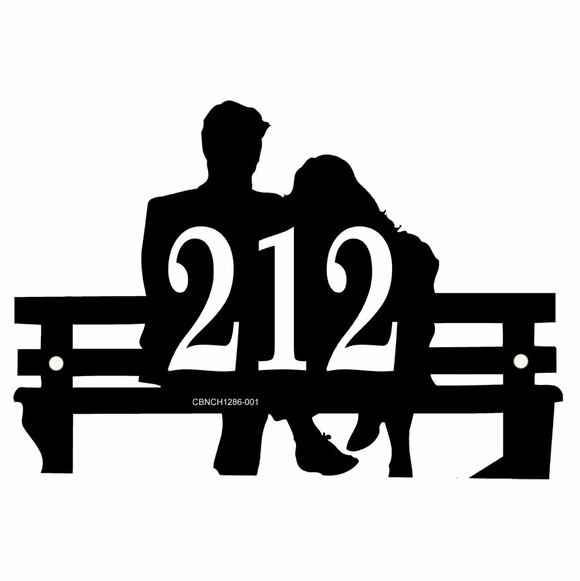 Bench Shape Silhouette Address Plaque - - custom made home address sign in the shape of a park bench and a seated couple sitting close with their arms around each other. Quite possibly the most unusual house number sign you have ever seen and a delightful way to display your street number. Made in USA. The perimeter and empty spaces of this silhouette style sign are cut to the actual shapes of the heads and bench. Even the spaces between the slats are totally cut out during the manufacturing process. The sample sign is shown on a white background (which means the empty spaces between the slats are white). When mounted on your wall, however, the main part of the sign is the first color in the combination you selected, the address numbers are the "character" color, and what shows through between the slats is the wall. 12" x 8.625" sign with one line of personalization. Wall mount. Special shape. Holds one line of up to three (3) 3" characters. Note: the style number you see on the sample bench is for internal use only and is not part of your custom sign. Personalized Bench shape address plaque crafted in the USA.